d where X is the wavelength of the incoming radiation and d is the diameter of the mirror or antenna. A sketch of the appearance is presented in Fig. 7. This is called the Airy diffraction pattern, and the inner part, within 0min is called the Airy disk. Figure 5.7. Approximate appearance of the Fraunhofer diffraction pattern from a parallel beam imaged through a circular aperture. 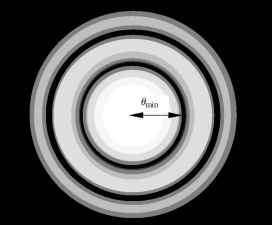 The radius of the first minimum (black) is 0m;n where sin 0min « 1.22 k/d for k ^ d. The inner bright circle is called the Airy disk. 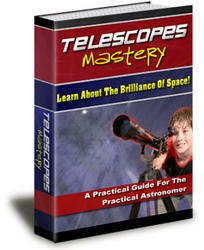 the face of the telescope. This is an easy way to remember and rederive, approximately, the expression (6) or (8). 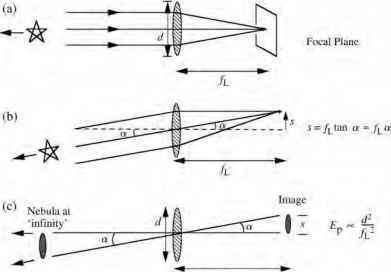 One can think: "the telescope can not distinguish incident angles that yield less than 1 wavelength phase shift across the face of the telescope. The uncertainty in arrival direction is thus ~k/d.